Barcelona, the capital city of Spain’s Catalonia region, is a vibrant city, with both a historic and modern feel. And is a perfect place to sit still, as well as to keep your feet in constant motion, no matter what time of year. With a sun that shines over traditional cafes, world-class museums, and Gothic architecture, you are sure to move through the streets with a sense of awe. In no particular order, here’s our list of 10 things to do in Barcelona, beyond the ordinary. 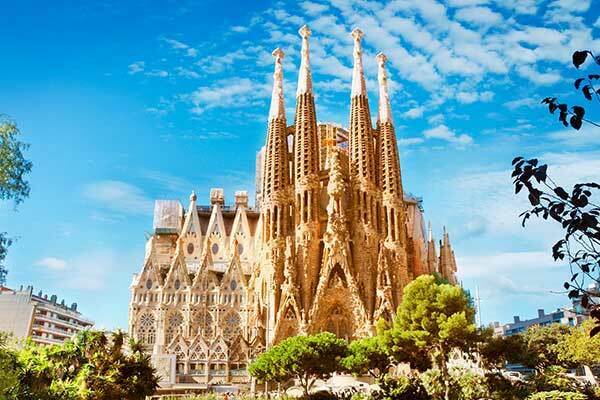 Without question, the most famous of all churches and attractions in Barcelona is La Sagrada Familia. Sagrada Familia is an ever-changing, towering Gaudi-designed magnificence over a city full of his whimsical creations. After initial construction in 1882, Antoni Gaudi himself took over this architectural endeavor in 1883, well-knowing that it would never be completed in his lifetime. Located between the T Marti and Gracia districts, La Sagrada Familia is easily accessible via short taxi rides from the heart of the city, and for those who want to avoid the crowds, inexpensive skip-the-line tickets are available year-round. 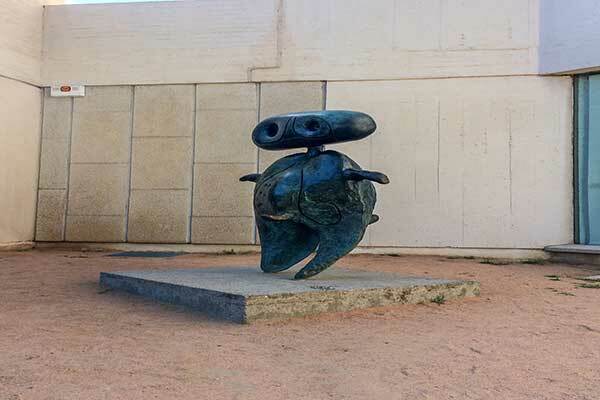 For fans of modern art, the Joan Miro Museum is not to be missed while visiting Barcelona. Grab a multi-lingual audio guide and meander through a personal tour of his most recognizable pieces, including more than 200 paintings and over 8,000 drawings. Located just minutes from the Olympic Stadium, the white-washed, winding interior leads you through Miro’s famous works and sculptures, as well as a fascinating fountain that continuously flows with mercury (behind a glass partition, of course). After strolling through the halls, make your way to the open-air roof of the structure to find a landscape of his surrealistic statues. Though photography is restricted inside, feel free to take a few pictures outside next to your favorite sculpture. Located on Montjuic Mountain, the Barcelona Olympic Stadium stands as a look back at Barcelona’s hosting of the 1992 Olympic Summer Games, as well as an homage to the culture and depth of Barcelona. From one of the best views of the city, take a guided tour where Gold Medals were won and history was made. Today, the complex hosts not only the original stadium that was built for the International Expo of 1929, but also the swimming complexes and numerous artistic spires built in celebration of the city’s accomplishment in the hosting of the games in 1992. One of the most peaceful and serene locations in Barcelona, you can close your eyes and still hear the firing of starting guns and roars from the crowd. Called the Museu Nacional Art Contemporani (or, “MNAC”) in Barcelona, this impressive, grand museum is one of the most popular in the city that celebrates modern Barcelona’s artistic accomplishments. On one of the grandest stages in all of the city, sitting high above the parks of Montjuic, the MNAC opens its gates for free on Sundays and includes one of the most stunning views in all of Barcelona. On weekends, tourists, locals, and vendors alike flock to this scenic property, including the massive fountain adorning its façade, to take in the food, art, and architecture of the setting. Not all the art is modern, however, as much of the collection is still dedicated to Barcelona’s past, that is equal parts Gothic, Roman, and Renaissance. Mount Tibidabo, at more than 1,600 feet, is the tallest mountain in the Serra de Collserola. For photographers and nature-gazers, this splendid view of a scenic city is breath-taking from the beautiful Sagrat Cor church which adorns its pinnacle. It’s not all about the view from Tibidabo though, as the mountaintop boasts numerous hip bars, tapas restaurants, glamorous shops, as well as child-friendly attractions for daytime amusement. One of the best, most intimate nights my wife Tracy and I experienced in Barcelona was sipping a sweet local wine on the rooftop of El Cercle (The Circle) restaurant, also centrally located very near Placa Nova. Though chilly up top during our visit, the outside heaters, the low din of the city, and the restaurant’s excellent menu filled the night with warmth as we overlooked the quiet streets of the central shopping district. With an accommodating staff and idyllic view looking back toward the city center, it can be the perfect end to a beautiful day. Though the main streets below may move quickly from nine to five, take time to take a breath and a view under the silent Barcelona moon. 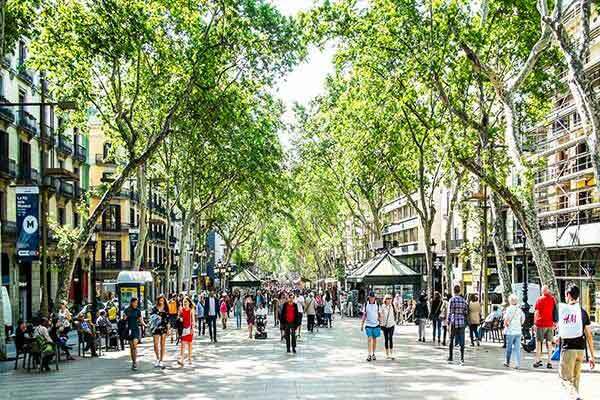 Whether staying in Barcelona for one day or one week, we’ve found the best way to see most of the city is by taking advantage of their ever-popular hop-on hop-off buses. 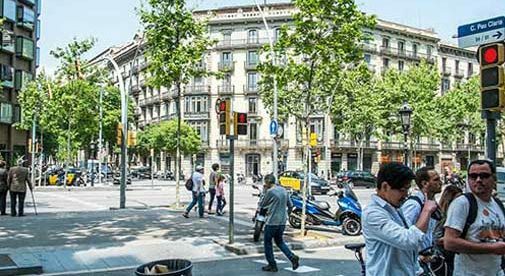 With stops all over town, this service is inexpensive and highly convenient in lieu of taxi cabs, given the sprawling landscape of an ever-growing Barcelona. 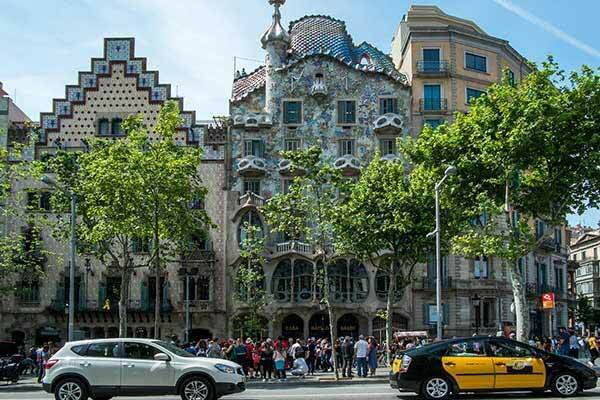 For about $37, depending on the vendor, this tour can take you along three different routes all day long, covering locations like La Sagrada Familia, the aforementioned Miro Museum, the streets of Gaudi architecture, and the Gothic Quarter. With 44 pick-up locations and arrival times around the clock spaced just between 10 and 25 minutes, you can stroll at your leisure. Choose a two-day pass if you’re going to be in the city long enough to take advantage of the deal. Though you may not need to buy the fresh catch of the day for your dinner, take time to choose a few local fruits to carry with you, or a freshly made (and delicious) fruit smoothie. 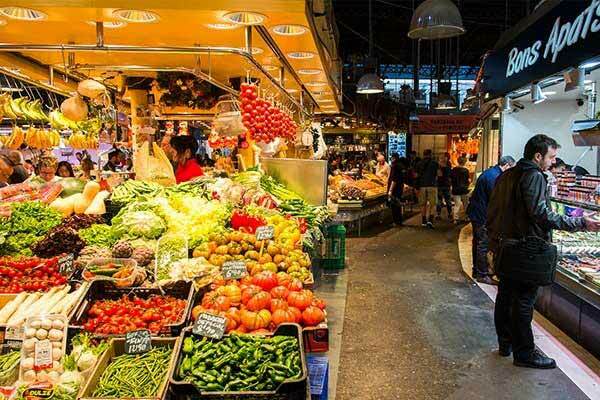 With a rolling, jewel-colored rooftop enclosing the large space, Mercat de Santa Caterina is a great repose from the midday Barcelona sun, a perfect place to take in the scents of the city’s bounty, and to walk among locals. At Park Guell, you can get inside the mind and lifestyle of one of Spain’s most celebrated geniuses—Antoni Gaudi. The former home of the legendary architect and designer, the mansion-turned-museum now displays what life was like at the turn of the century for the prized Barcelonan. Along the stretch of road where La Rambla and Placa de Catalunya street meet, there is a quaint and central place to take a seat and watch the people pass by. At the Café Zurich, located just steps away from one of the many hop-on hop-off bus stops, take a long brunch, and enjoy the hustle of the mid-morning local Barcelona residents with a slow meal. Try an espresso and a plate of delicious mussels, olives, and sardines for a truly local taste experience. Personally, I enjoyed their Estrella Damm beer for a different twist on a breakfast mimosa. With a kick of lemon, the crisp flavor complimented the seafood very well. Eat slowly, no matter the weather, and listen to the city move as you muse. While there is no shortage of experiences to be had in the beautiful city of Barcelona, take time to make your way around leisurely but with purpose, and have fun. Grab that glass of vino, a plate of local fare, see the art that defines generations found only here, and you’ll find yourself at home.